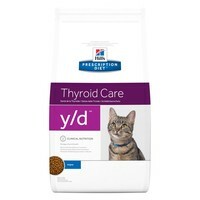 Hills Prescription Diet YD Thyroid Care Dry Food for Adult Cats is a complete and balanced diet to safely and effectively manage your cat’s thyroid health. Made with lower iodine levels to keep your cat’s hormones at a normal level to reduce the symptoms of hyperthyroidism, Hills Y/D has been clinically proven to improve thyroid health within 3 weeks when fed as the sole source of nutrition. Hills Y/D Thyroid Care also contains controlled levels of phosphorus, sodium and magnesium to help and support your cat’s kidneys and urinary tract health.